I downloaded the Joomla 1.6 Blue theme template but when I upload it I got this error message about XML setup file not being found. It seems to me that it is a common problem happened to many people. Could you let me know how I can install the template properly on Joomla? 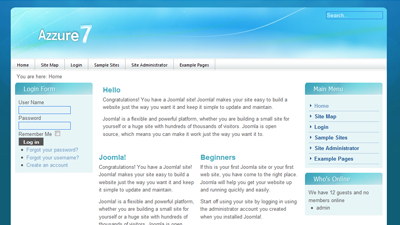 Are you sure you are using Joomla 1.6? If the template has web site modules position it is much better. It has module positions. Check the xml file do see which ones they are. This free theme is released under creative commons license,therefore all links in the footer must remain intact. You have downloaded this theme for free and all we ask is one link back. All my modules are ON, including footer module, Ive tried to change position of this module but this note still appears…any advice? I just tried it and it works for me. Download it again and try to install it. It only works if you have the footer links there.